Purchase the ad-free PDF formatted pattern file for this crocheted Granny Filet Square Afghan on Ravelry. Or find the pattern on my blog below! 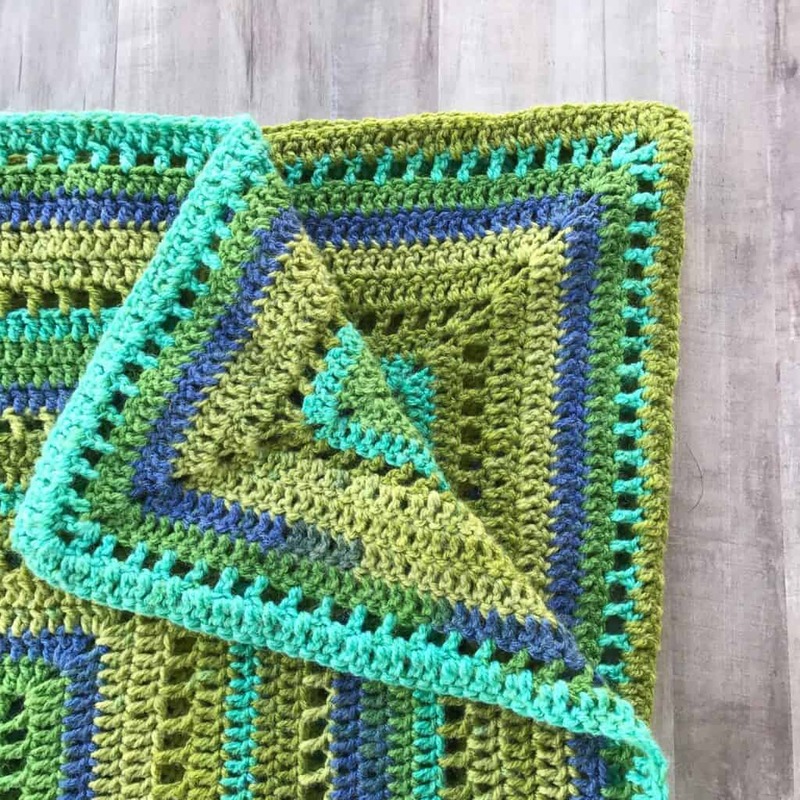 Isn’t this just the most simple yet perfectly detailed blanket?! I love love love blankets made out of one large granny square, so I made one with a little twist. For this afghan, I created a large solid granny square with rows of filet to keep it a bit breezy. I love the little detail of the little blocks. I think it makes it look very pretty and delicate. When I first started this project, I made the little filet squares between only two solid rows but I found that too “hole-y” for my taste. However, that may be right up your alley if you’re looking for a very light afghan! 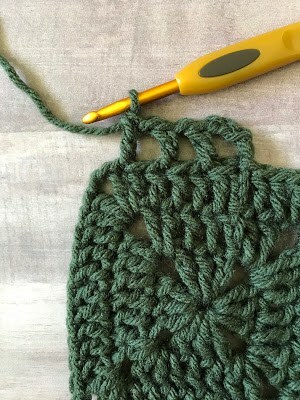 Once you get going on this project, it’s a very easy and mindless project that you can do while relaxing and/or watching one of your favorite shows. I worked on this project intermittently between other projects. It was very much my go to project when I wanted to do some mindless stitching. The best thing about this afghan is that you can make it as large or as small as you’d like. The pattern is a five row repeat and once you get past the first few repeats, you won’t need to look at the pattern anymore. I found that using just two of the regular Caron cakes, it made a nice sized baby blanket. 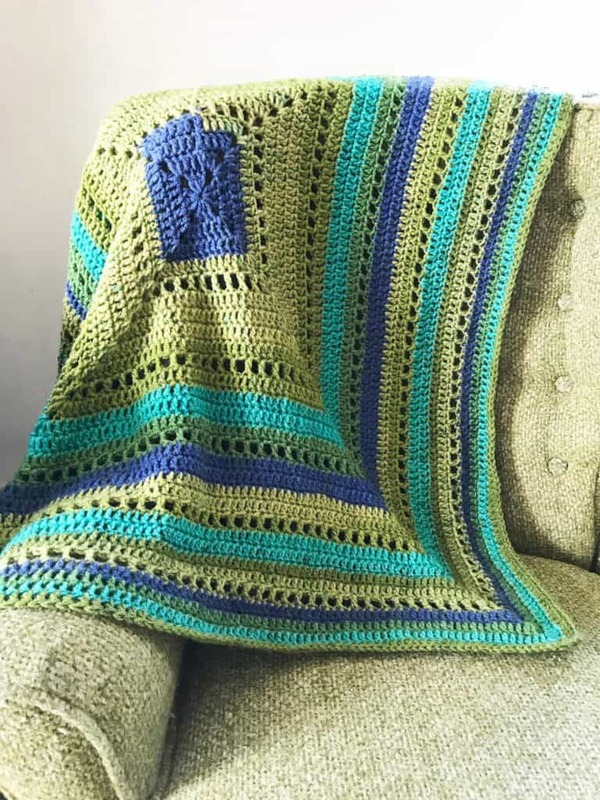 I had 3 Caron cakes in the Blueberry Kiwi color that is now discontinued, so I used all 3 to make a good sized blanket for my 6 year old son. When using Caron cakes, the color can change mid-round which may not be favorable but I was okay with that. If do not like your color running together mid-round, I have seen some projects where you cut and attach as needed to make your color changes a little more structured. Fair warning here – you will have to block your finished project! 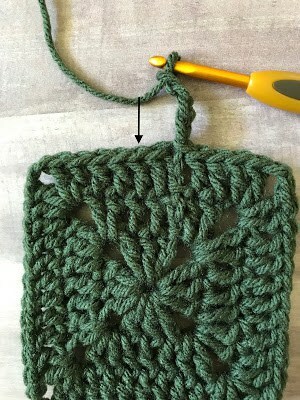 The larger you make the square, the more it will tend to curl up on the edges and look a bit uneven. 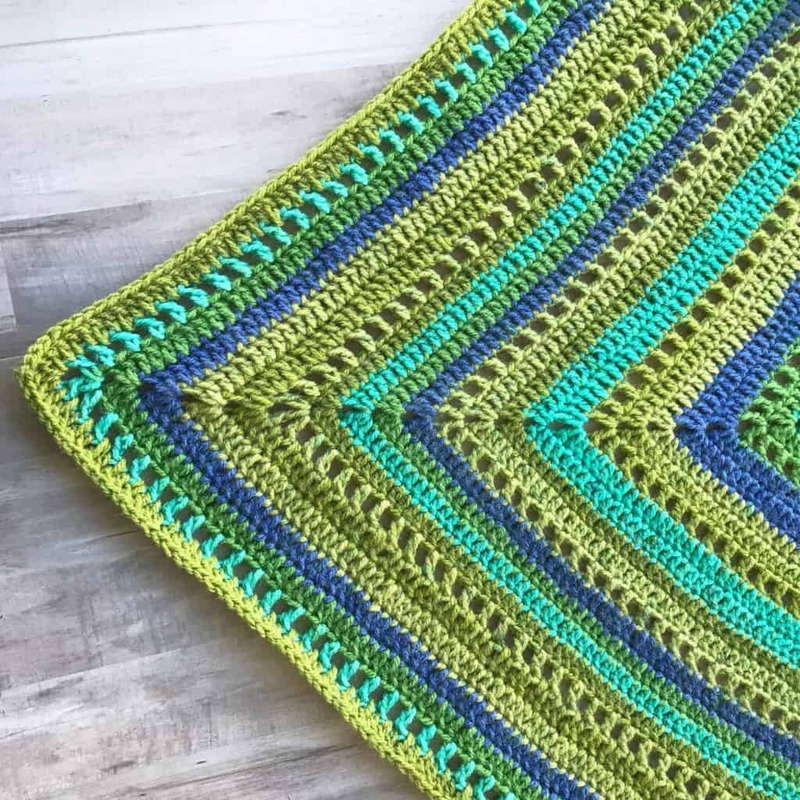 I was told this is the nature of very large squares and although I tried changing up my stitch counts and used different yarns – the verdict was I had to block the project. So keep that in mind! I know many are not able to use the Caron Cakes because of the wool content in it. However, the line of Caron cakes has expanded and they have included a “Caron Big Cakes”. The Caron Big Cakes are 100% acrylic and have around 600 yards of yarn in just one cake! To me, that sounds like the perfect yarn to make this project! Chain 3 in the beginning of the rounds count as a stitch, when making the next stitch be sure to crochet into the next space and not the same space as the Chain 3. “Corner” is referring to the chain 2 spaces in each corner of the square. You may use any type of yarn, just make sure to adjust hook size as needed. You will need to block your project after completion. Blanket shown was made with 3 Caron cakes and came out to be approximately 47” x 47” once blocked. Round 5: Chain 4, skip one stitch, DC, *Ch 1, skip one stitch, DC until you get to the corner, (Ch 1, DC, Ch 2, DC, Ch 1) all in corner. Repeat Rounds 2-6 until desired size of blanket is acquired. Here are a few photos to help you along with the filet rows. Suggestions for blocking a larger item like this? If I use the carpet/floor it would involve moving furniture. I do mine on a guest bed. I've had 1 or 2 cases where I have to block it folded in half because it wouldn't fit, in which case I stick something tubular (like a pool noodle) in the fold so it doesn't crease. That's a great idea! I am just starting mine. But, I usually go big. I can't for the life of me figure out why my sides are longer than my top and bottom and it's bugging me. They were all equal until the first round of filet stitches, then my next round of dc and my sides are both 1 stitch longer than my top and bottom. I have undone and redone several times and i cant find my mistake. Any ideas? 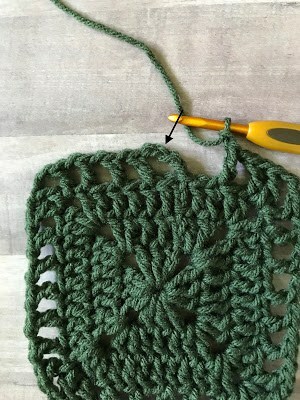 I am having problems with stitch count to for Row three. It's stated 12 but I keep getting 11. 7+4=11 and I count 11 in the screen shots too. What is the correct number please. Is this a typo in pattern instructions? Thanks for the pattern! Mine turned out great. I ended the pattern with 2 rows of single crochet to add an edge to it. This was a fun blanket to make!